Phoenix Suns point guard Steve Nash shines brightest during on-court chaos, and he’s got a plan to do the same in business. Twelve seconds left in the season opener. Phoenix Suns 107, Los Angeles Clippers 107. Twelve seconds for Steve Nash to find a way to win. The Phoenix coaches outline a plan. Suns’ ball. Nash, the team’s wily point guard, will let the clock nearly expire before executing a play. As Nash dribbles, Clippers point guard Baron Davis defends him closely. Guarding against the very play the Suns called. Guarding against Nash going right. Nash abandons the plan and darts left. Time to make up a new play. On the fly. To watch Steve Nash is to observe someone uncannily at ease with change. Rapid change. Whenever possible, he plays on the run, starting a fast break rather than a set play, orchestrating a free-form attack. What sounds like a recipe for sloppy basketball proves highly effective in Nash’s hands. When Nash signed with Phoenix as a free agent in 2004, he took over the NBA’s riskiest and most unorthodox offense, one that required his team to get a shot off in seven seconds or less. And Nash soared. Already an all-star, he became more dangerous at hyperspeed, choreographing a thrilling dance of snap decisions and eyes-in-the-back-of-his-head passes. He is only the ninth player in NBA history to win consecutive league MVP awards. Both on and off the court, Nash’s exploits illuminate lessons about how to manage these transitions. The son of a professional soccer player, he didn’t take up basketball until eighth grade, but then transformed himself into a top high-school player. At little-known Santa Clara University, in California, the only school to offer him a scholarship, he worked himself into a first-round NBA draft choice. He began as a bench player with an iffy back who later revamped his exercise regimen — and his game — to become a surefire Hall of Famer, the 38th best NBA player of all time, according to über-blogger Bill Simmons in The Book of Basketball. Nash was a camera-shy and endorsement-averse pro even as he became an all-star; he now pitches ad ideas to Nike and Vitaminwater and relishes cameos on Entourage and The Late Show with David Letterman. Nash is still 25 feet from the basket. Scanning his options. He pivots. What to do next? Pass to Grant Hill on the wing? To Channing Frye near the basket? Take it himself? When Nash reached the NBA in 1996, he had a plan for how he would handle life as a pro: He wouldn’t pursue the spotlight. He relished his privacy and was uncomfortable with the attention. After he made the all-star team in 2002 and helped turn the Dallas Mavericks into one of the league’s top teams, Bill Sanders, CMO of BDA Sports, which represents Nash, wanted to build a brand around his budding star. In a league that celebrated one-on-one moves and showy acrobatic dunks, Nash, a very mortal 6-foot-3, was a fan favorite because he dazzled at a lower altitude with ball handling, passing wizardry, and team basketball. Nash listened to Sanders, and said what NBA players never say: I’ll pass. At the top of Nash’s list was making a positive impact through his foundation, which helps poor, sick, abused, or neglected children get a shot at better education, health care, and opportunity. For years, he quietly wrote checks to charities. “I had a real problem with getting attention for charitable giving,” says Nash. “I felt like that was a contradiction of the whole point.” He also had a problem saying no until he hired a childhood friend, a lawyer specializing in not-for-profits, to run his organization in 2005. 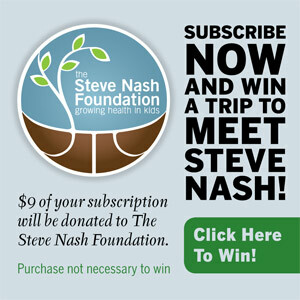 The Steve Nash Foundation, much like Nash himself, is highly effective but not self-aggrandizing: The Sports Philanthropy Project and the Robert Wood Johnson Foundation gave it the 2008 award for excellence in sports philanthropy, yet Nash’s foundation didn’t even issue a press release when it donated $200,000 to provide pediatric cardiology care for a hospital in his wife Alejandra’s home country of Paraguay. It was time for the reluctant icon to pivot. Nash flies toward the basket. He can still pass if the Clippers cut him off. They don’t. He splits two defenders and has just enough room to attempt an off-balance layup. He swings his arm wide. Uses his off hand to flip the ball up. Sometimes his job is to make his teammates look good with perfect passes. But this time, he seizes the moment. He lets the documentary interview run longer than scheduled. The same with a subsequent shoot related to the upcoming Olympics. The next day, after practice and a workout, he meets execs at the original Steve Nash Sports Club to hear how the burgeoning chain is courting Canadian Olympians and NBC staffers during the Games. That night, once the game and press conference are over, he returns to the court, his voice growing hoarse, to address a couple thousand rapt kids from Steve Nash Youth Basketball. Riding in an SUV between gigs, Nash texts with colleagues about his entrepreneurial projects (and checks on his wife and 5-year-old twin girls), giving his iPhone the kind of fierce workout he employs to protect a congenital disc problem in his back. “Steve doesn’t waste time,” says Jenny Miller, executive director of his foundation. Nash now has a business plan for the newly formed Steve Nash Enterprises, a portfolio of a dozen ventures. He has started a film-production company; become a part owner of the Vancouver Whitecaps, which will join Major League Soccer in 2011; and taken equity in several startups, including Mission Skincare, which develops products for athletes based on field testing from him, Serena Williams, and other elite pros. Ultimately, part of the revenue will go to his foundation. Nash’s layup — “the old-white-guy-at-the-YMCA shot,” he later calls it — arches just beyond a defender’s reach and drops in. The Suns lead by two. Davis catches the ball and slaps it in frustration. Meathawk began in 2007, when Nash pitched Nike an idea for a Web video. A passionate environmentalist, he wears a Nike shoe made of recycled materials called Trash Talk, but he wasn’t the centerpiece of a LeBron-like campaign. If he was going to boost his exposure, he might as well ask for creative control. “Training Day” depicts Nash’s unconventional off-season regimen in New York, playing soccer and tennis, and dribbling a basketball while skateboarding. It captures his passion and versatility, as well as his free spirit. Producing his own videos allows Nash to play the endorsement game on his terms — and to reveal a sardonic sense of humor that superstar athletes rarely show the public. Shortly after he signed with Vitaminwater, the company agreed to green-light a couple of videos Nash wrote. In “The Spokesman,” he satirizes the stereotypical celebrity jock. Interrupting a typical day at Vitaminwater headquarters, he announces over the cubicles, “Excuse me. While I’m here, does anyone need an autograph?” He confronts an employee about having only one banana’s worth of potassium in its bottled water. “I want two,” he says, cramming in a second banana. The irreverence fit the brand so well that Vitaminwater executives ran the viral video on TV during March Madness last year. In 2008, Nash followed a similar strategy to get Meathawk’s biggest gig yet. He heard about ESPN’s 30-for-30 project — 30 independent documentaries for its corresponding anniversary. The filmmakers, including notable veterans such as Barry Levinson, Peter Berg, and Ron Shelton, as well as newcomers, would tell personal stories about overlooked sports moments of the past three decades. Nash was the only pro athlete who pitched ESPN on a film. Over lunch in the West Village with ESPN Films executive producer Connor Schell, he recounted the story of Terry Fox. In 1980, the 21-year-old Canadian who had lost a leg to cancer began running across the country on his prosthesis to raise money for research. He ran near-marathons every day for 143 days until the spread of the bone cancer forced him to stop after more than 3,300 miles. The extraordinary effort made Fox, who died in 1981, a national hero. Nash had followed the trek as a boy. “We never got the sense that Nash was a guy slapping his name on something,” Schell says. “The story was a personal passion. He’s really talented at this, and he’s willing to do his homework.” The one-hour documentary is scheduled to air in the spring. The Clippers go for the win. A 28-footer for three points. No good. The final score: Suns 109, Clippers 107. In the fourth quarter, Nash scored 15 points, nearly half of the Suns’ total. He took over the game. Another game day. Another night of transitions and improvisation. Seven hours to go before tip-off.